Homemade coconut milk is one of those things, like basic oatmeal, whose lack of consistent recipes online frustrates me. All I want is a simple formula that’s easy to make, not too messy, and the perfect thickness to use in everything from a 3 ingredient piña colada smoothie to quick veggie curry. 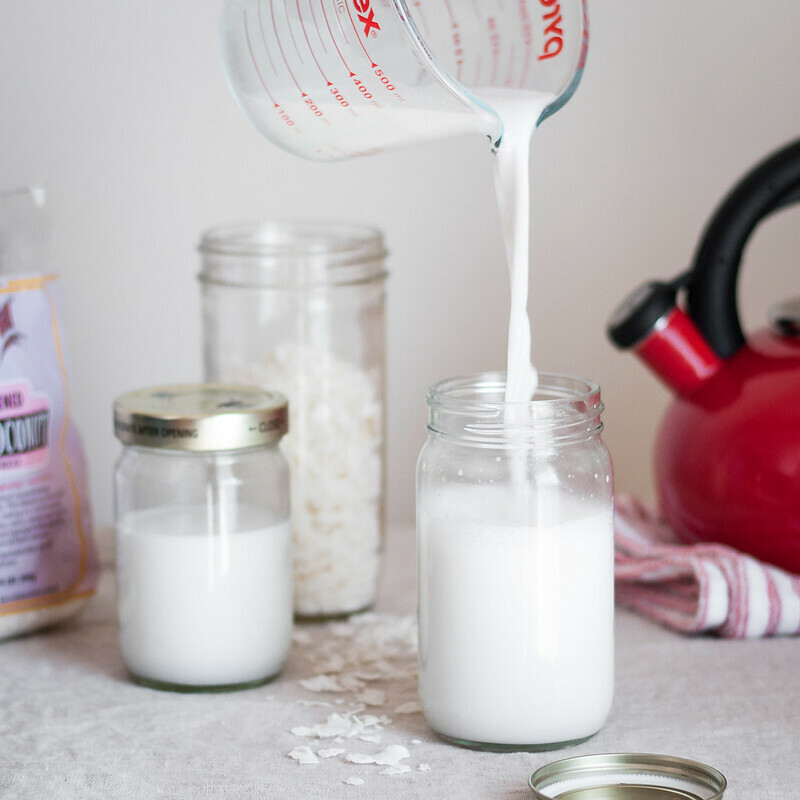 After searching far and wide for recipes and finally settling on my own unique formula, it only makes sense that I add to the internet confusion with yet another recipe for homemade coconut milk. The best one, of course. 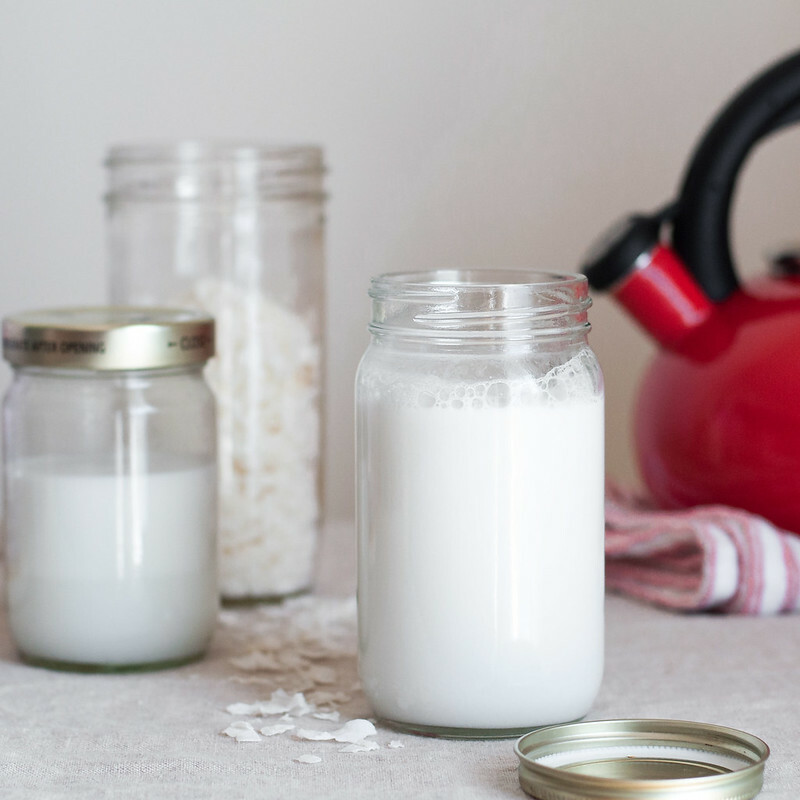 Let’s discuss the obvious first, though: why spend the time making homemade coconut milk when there are multiple shelves of it in so many grocery stores? As much as I believe in homemade ingredients, sometimes it’s just not worth the hassle. I know I’ll encounter naysayers, but after one too many messy cheesecloth situations and marathon soaking times, it’s worth it to me to buy almond milk pre-packaged. I’ve done the math, and I actually save money buying good quality almond milk over the cost of purchasing raw, organic almonds. What makes coconut milk a different story is the simplicity, cost savings, and, last but not least, the totally divine smell. Popping open a can of coconut milk is, in fact, easy, but there’s really very little sensory experience involved. Sacrificing just a few extra minutes transports you via smell to a tropical paradise far from whatever rushed daily routine you might face. Say you’re running a busy household and don’t exactly care about some super connected sensory food experience. I’ve got you. Given the low price for a bag of unsweetened coconut flakes, I estimate that the cost of making coconut milk from scratch is as little as half of its retail price. When you’re feeding a house full of smoothie-chugging, possibly lactose intolerant mouths, that’s probably far more exciting to you than any tropical smell will ever be. 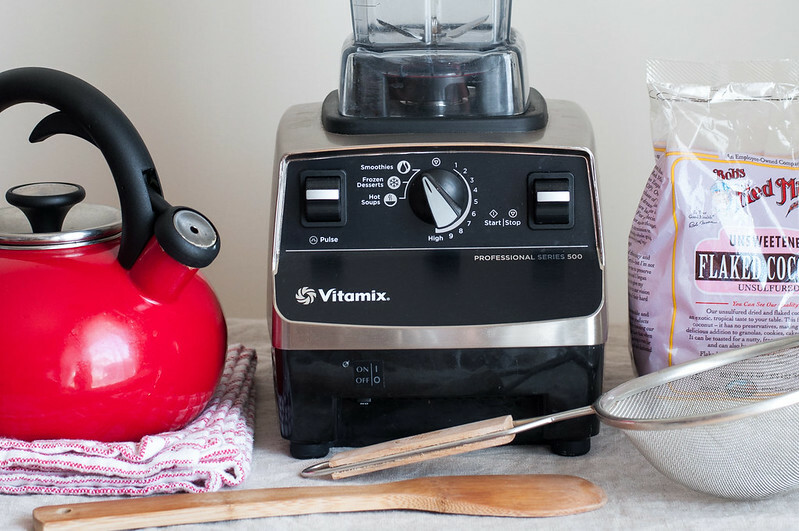 And, if you are drinking lots of smoothies, chances are you have a blender, the primary piece of equipment required for homemade coconut milk. Other than that, you’ll need a fine mesh strainer, which will set you back about $8 and quite possibly become one of your most used kitchen tools. Best of all, there is absolutely no cheesecloth involved. Hooray! If you’re looking for more ways to incorporate coconut milk and its healthy fats into everyday cooking, this tutorial is actually a precursor to the quick veggie curry recipe I’ll be sharing in a few days! Instead of making a great weeknight dinner by executing a perfectly authentic Indian curry with 18 different hand-ground spices, elevating a key ingredient, like coconut milk, adds a special touch and amazing flavor to a straightforward recipe. Clearly I could go on for days about how homemade coconut milk has changed my life, or at least my kitchen, but it’s one of those things you might want to see to believe. Here’s a look at the key moments from the oh-so-quick process; the recipe follows. 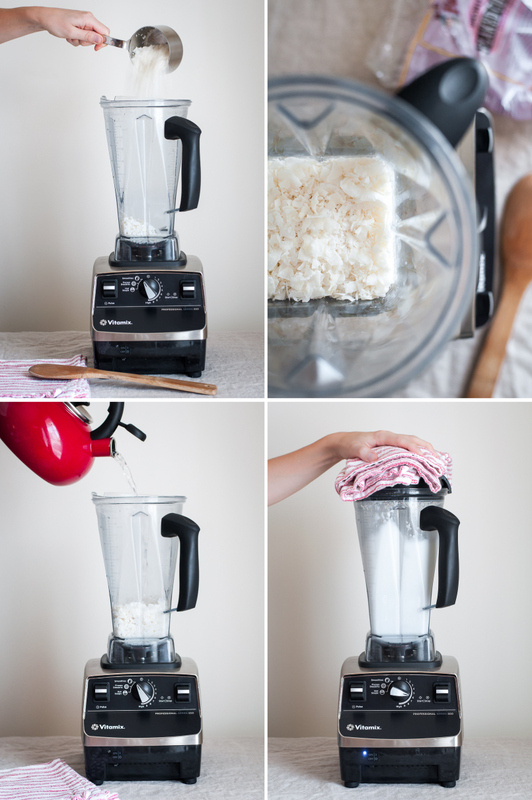 Place coconut in blender. In a small saucepan or a tea kettle, heat water over high until it just barely simmers--you want it very hot but not fully simmering or boiling. Carefully add hot water to blender with coconut, cover, and place a folded dish towel over the lid so it's completely covered. This is to protect your hand in case some water (or coconut) escapes. With your hand over the lid, pulse or blend on low for about 10 seconds to start to break down the coconut and expose more of it to the water. Let sit with the blender off for 3 to 5 minutes. Holding the lid again, blend, starting on low and quickly working up the speed to high, for about 2 minutes. The mixture should be quite smooth with few to no visible coconut flakes remaining, and it will smell absolutely divine when you carefully remove the lid. 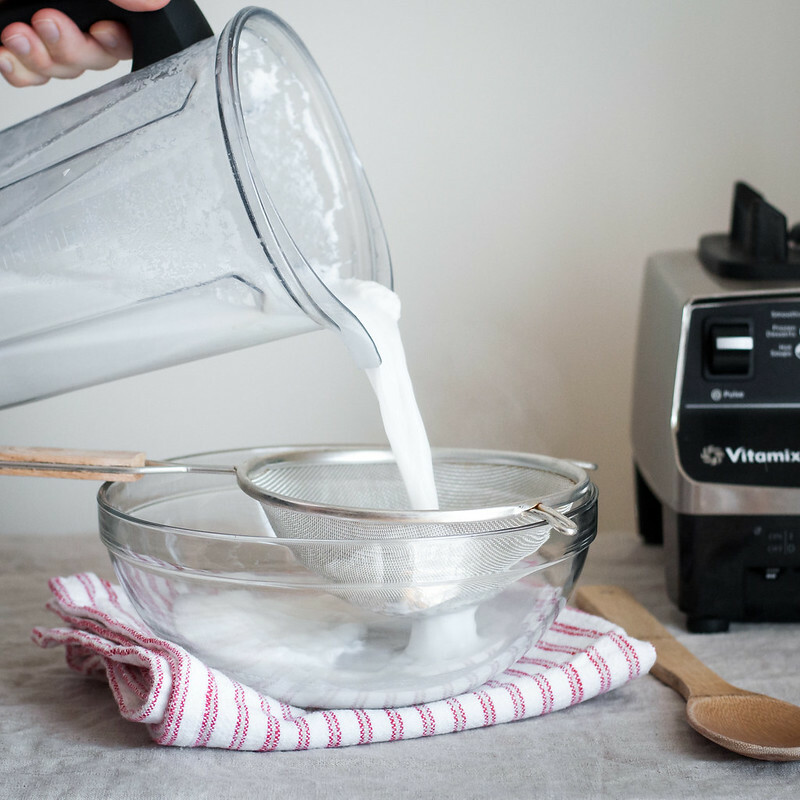 Hold or rest the strainer over a mixing bowl or pitcher and slowly pour the milk through the strainer. Most of the milk will run through easily. Stir the remaining thick mixture in the strainer with a wooden spoon, then press it with the back of the spoon to extract all the liquid. Use the coconut milk right away for any hot dishes, or transfer it to a resealable container and refrigerate until needed. Coconut milk keeps well in the refrigerator up to 3 days. Because it's so easy to make fresh, I don't recommend making and storing large quantities in advance. Coconut milk will separate as it rests, so stir or shake before using. 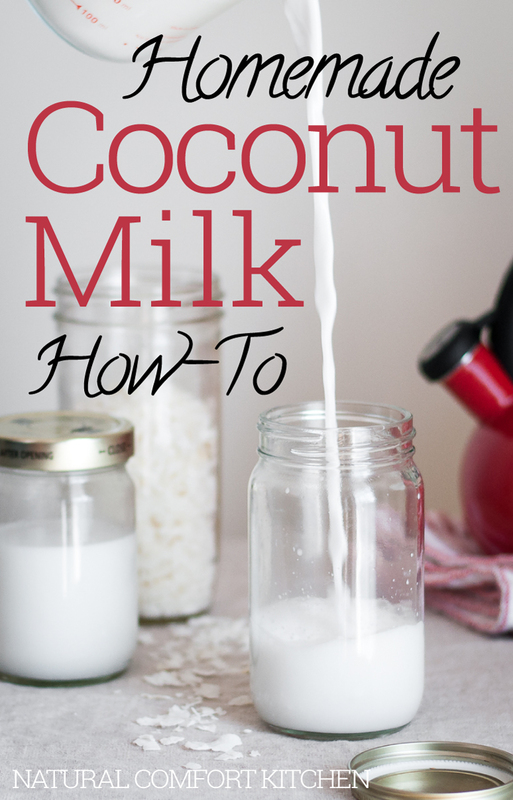 Adjust the consistency of the milk by playing with the ratio of coconut and water. 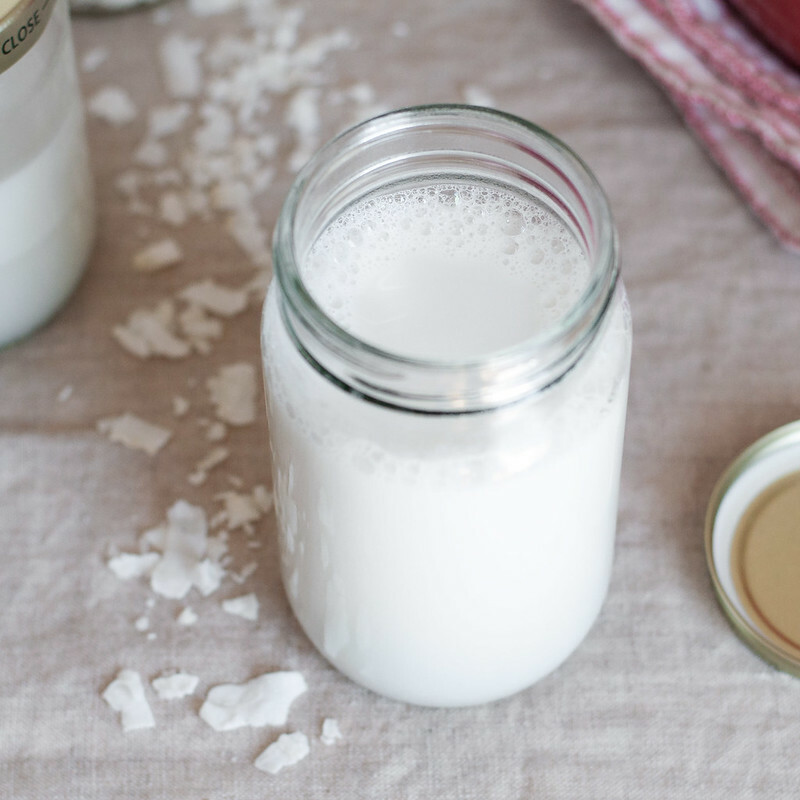 Using more coconut will result in a thicker, more concentrated milk, while using less (i.e., more water) will yield a thinner, milder milk. I prefer these thick coconut flakes, but it's perfectly fine to use a finer coconut shaving or shred if you have it on hand or if that's all you can find. It typically costs much less if you can find it in a store instead of online (the 4-pack is a decent price). I usually toss the coconut pulp (waster, I know), but you could save it for smoothies or dry it in a low oven to make your own coconut flour. Note: This page contains affiliate links. It does NOT contain sponsored content. Affiliate links (to products I recommend, on Amazon) offset my ingredient and website maintenance costs, so I can keep bringing you homemade recipes like this one. Thanks!